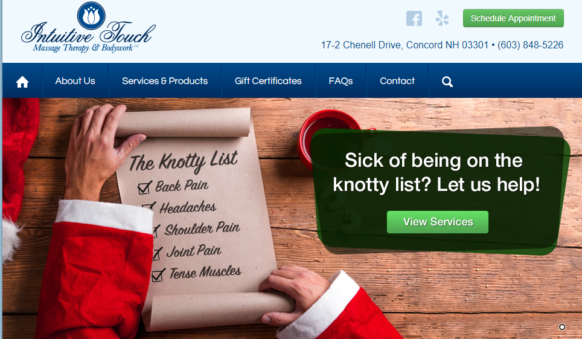 Are you on the knotty list? Whether you are or not, you really need to ask for a gift certificate to Intuitive Touch! You’re going to definitely get hooked after your first visit! If you’re looking for the perfect gift to give, you found the right spot here! Intuitive Touch Massage Therapy & Bodywork offers traditional services as well as many different services such as one called the 4 Handed Massage. They are located in Concord and have won many Best Of awards. Stop here for your gift shopping, everyone will be happy, for sure. « La Carreta Holiday Deal!